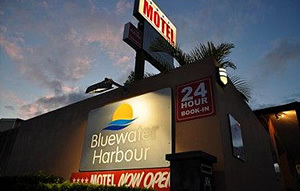 The Bluewater Harbour Motel is ideally located adjacent to Bowen’s CBD opposite parklands and only 500 meters to the Bowen Marina and Front beach. Enjoy this modern motel that is close to clubs, restaurants and the beautiful blue water harbour that is Bowen. 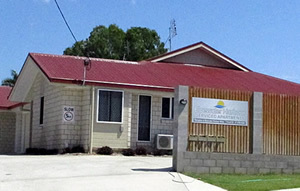 We provide high speed internet both hard wired ADSL and excellent wireless service to all rooms. Foxtel is also provided free of charge through 9 popular channels delivered through wall mounted flat screen TVs. All rooms have super quiet split system air-conditioning and all car parking is undercover. Families are catered for with either one or two bedroom self-contained rooms or in our other property that has one and two bedroom Family Villas. Dining room open for dinner Monday to Thursday. Heavy vehicle and additional parking available. Located in Kings Rd, just around the corner, is located our one and two bedroom Villas. Our Villas are designed to make doing business in Bowen a pleasure. Both the 90 Square meter One Bedroom and the 100 square meter two bedroom Villas feature luxury furniture full sized kitchens leather lounges queen beds and each bedroom has its own ensuite. All Villa guests have full access to Bluewater Harbour Motel’s facilities including our Business suite, pool and in-house Breakfast and evening Meals in our Dining Room.